Hampshire fast bowlers Brad Wheal and Ryan Stevenson have signed new deals, keeping them at the county until the end of the 2017 season. Wheal, 19, born in Durban but a British passport holder, has played four first-class matches since his debut in May. 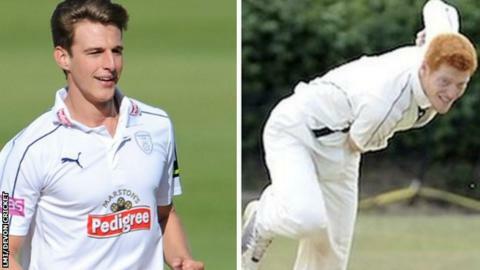 Stevenson, 23, joined the county last month on a short-term deal after impressing for minor county Devon. The right-armer made his debut against Durham, helping Hampshire to a seven-wicket victory at Chester-le-Street. Stevenson recently spoke of his intention to return to his campsite business at the end of his short-term contract. "It's great to have that stability to know I will be at the club for at least the next two years," he said. "I'm really looking forward to working hard on my bowling to hopefully cement my place in the first team." Wheal has taken eight wickets in his four first-class appearances and has also impressed on his appearances for Scotland A.